Modern caravans don’t have nearly as many problems with water ingress as older models, however, there are still measures you can take to prevent excess moisture. It’s not a glamorous subject but, left unchecked, damp can ruin your caravanning experience and take time and money to fix. Our experienced members know that it’s worth working hard to prevent it from occurring. There are a number of causes for damp, including; moisture penetrating structural damage, faulty plumbing, spillages and condensation. Regular maintenance checks, thorough cleaning and ensuring good ventilation and airflow are basic steps you can take in preventing these causes of water ingress. The primary precaution to take is to check for damp. Catch it early and you can avoid major damage, potentially saving your caravan. A thorough inspection should be undertaken regularly, checking for any signs of moisture or structural damage (possibly just general wear and tear) which could lead to water ingress. You may find it best to get these checks done professionally. 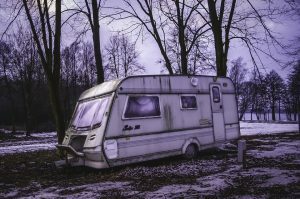 If you do perform your own checks, you should look for damp in the following places; around awning fixings, along joints, around lights, grab handles and vents, under trim, around doors, windows and wheel arches and in all corners of your caravan. It’s also a good idea to reseal or replace edges and trims around windows and awning fixings, cleaning thoroughly first. Another obvious point of attention, especially where caravan plumbing is concerned, is the shower unit. It’s often a good idea to reseal the compartment and this can be done fairly easily at home. Like resealing other edges, it’s important to properly remove previous sealant and clean surfaces thoroughly before applying the new sealant. If you do have a damp caravan, instead of using a heater, which can cause condensation, try a dehumidifier. These extract moisture from the air and circulate it using a fan. Removing or piercing surface panels may be necessary to thoroughly dry out areas where there is poor airflow. More extensive water damage may require professional attention. Consult your manufacturer warranty to decide on the best course of action – this may be returning to the original dealer for work or seeking quotes for repairs from reputable workshops. As many will testify, there’s nothing worse than spending a holiday in a damp caravan. Investing time and effort in regular maintenance can save a lot more time and money in the long run. It may not be fun but it’s well worth it.